After nearly 13 years, I’ve reached a Maton nerd milestone… one of each Fyrbyrd model. From FB620 to FBFX. I’ve “officially” been a vintage Maton fanatic since 2003. That’s when I saw my first Fyrbyrd, being played by a guitarist in a support band at a Tremors gig at the iconic Annandale Hotel (which is now tragically a f*cking burger bar). 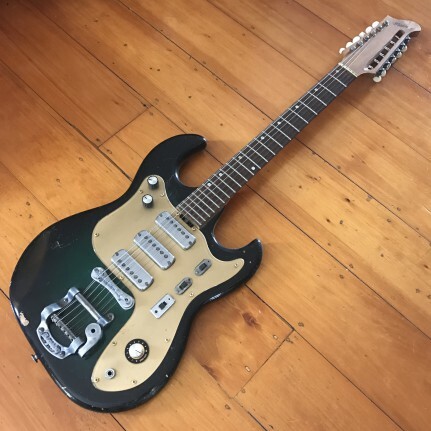 Soon after I bought a Maton Phil Manning Custom Stereo at Swop Shop in Melbourne and then it went a little crazy from there. 13 years later and I’ve finally tracked down an example of each Fyrbyrd model. 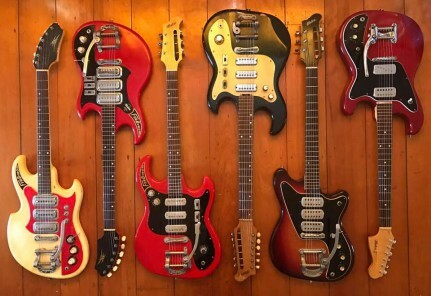 It’d taken so long as these guitars are so rare… three of these models there were only 70 guitars or less made. So what I thought would be cool would be to describe the differences of each throughout the stages of the Fyrbyrd name until it’s final form, the FBFX. First up is the iconic “sharkbite”1963 FB620. A friend of mine found this beauty in a junk shop in the Blue Mountains back in 2010. It had led a hard life… it’s neck had the dreaded Maton twist and most of it’s parts were loose in the original (very battered) Stanford case but Tim from Tym Guitars did an amazing job into making it player perfect. 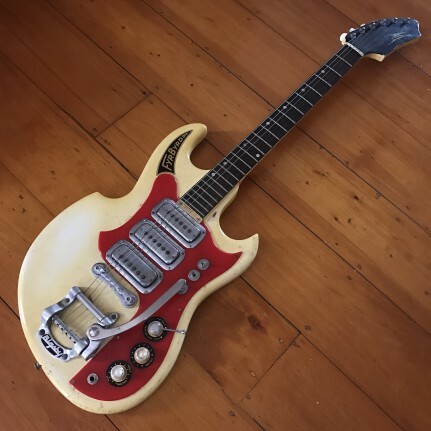 I’d owned a sharkbite before but it had been repainted in a horrible white poly finish with the wrong headstock decal (plus modern tuners) and I was after something more original… which this is. The neck on the early sharkbites are quite fat… sort of a ’58 Les Paul fat. Mine is one of the rarer examples with the Triumph dashboard flip switches… which while rare are damn awful and made it near unplayable. I changed them to smaller modern flip switches which help a lot. The Maton pickups are really loud, sort of like a cross between a P90 and a Dearmond and the Sound Barrier switch is really useable in cutting down some of that output and making the pickups more twangy. It’s a great guitar and one of my favourites. Next up is my 1964 Fyrbyrd FB620. This is a near mint, museum quality example of the non-sharkbite version of the Fyrbyrd. Literally every screw, solder joint and pot is untouched. The serial number is in the 900′s so it’s just before Maton slightly changed the model with a larger headstock and thinner neck (very similar to the Ibis neck). The neck shape on the 900 series non-sharkbites is a bit different to the earlier models… it’s slightly less fat and “quicker” to play plus a touch narrower. If a non-sharkbite has lost it’s serial number, I can usually tell a 900 series as they’re quite distinct. The pickups are slightly less hot than the sharkbite but these pickups are notoriously inconsistent . Next is the first major change to the Fyrbyrd… the FB650. The FB650 was part of Maton’s new range in 1965, which included the 12 string 1220 and the Maton Leaderman (which replaced the Flamingo). The body shape was completely different to the sleek offset FB620. With the FB650 Maton was starting to get more into Fender territory. The main hardware from the FB620 remains… the same pickups and Bigsby, but the cool “Sound Barrier” stalk switch has disappeared. The tone control has been spilt into two… one treble and one “bass expander” which is actually a great idea! Maton also fixed a common complaint of the FB620 and flipped the pickups switch so that they’re horizontal, which helps stop the guitarist switching pickups by accident when strumming. The neck is from the upcoming 1968 Wedgtail… really REALLY thin and sporting the stylistic 3+3 split headstock. This is actually my pick of the bunch as a player… the pickups are loud and fat and the neck is thin and really fun to play. So while it sounds similar to the previous FB620, it plays completely differently. Only 60 or so examples were made of this model so they’re very rare. Next up is the 12 string version. A friend of mine spotted this in a Brisbane guitar shop that had only opened up that week and then closed a few months later. 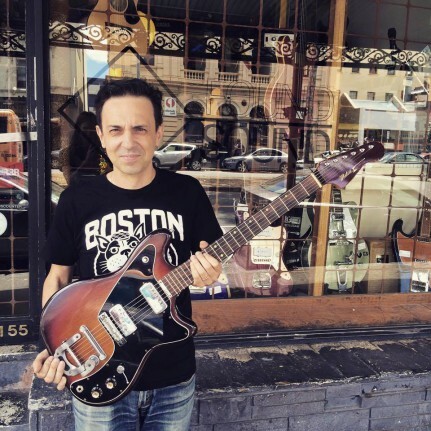 The owner had owned a music hire business in the 80′s and had amassed a ridiculous amount of cool vintage gear, so he opened up his own shop to sell it all along with some new gear. I quickly sold my beloved red Maton Apollo and grabbed this rare Byrd. These 12 string Fyrbyrds rarely come up for sale and when they do the prices are crazy… due to the fact Neil Finn from Crowded House still uses one onstage. Mine is in the Jungle Green finish and came in it’s original Stamford case, along with the two pickup switch covers which I have to fit one day, along with the Bigsby arm. The original knobs are gone so I’m the hunt for some of those… the volume knob is a bigger version than the usual metal Maton knobs and rarer than rocking horse poop. As a player these things are amazing. I can see why Neil still plays his… the neck are crazy thin for a 12 string and pretty wide… you have quite a bit of room to make open chords and barre chords are no problem. The Maton pickups are beautifully fat but with heaps of chime. I lent this guitar to my band mate for his other band and the studio owner wanted to keep it. A great great GREAT guitar. I’ll get it completely set up and back to 100% in 2017…. as soon as I find those goddamn knobs! 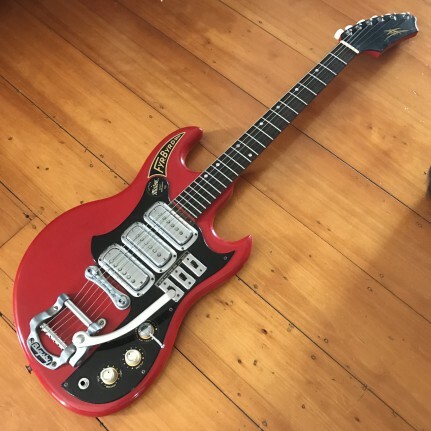 The 1968 FB70 was pretty much a completely different guitar from the original FB620 Fyrbyrd. 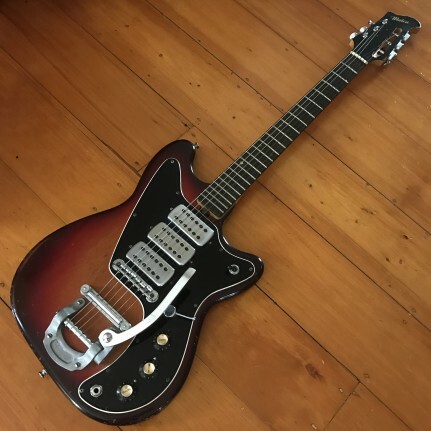 By now the Maton single coil pickups had become humbuckers, the individual pickup switches was now a Gibson style three way switch, and the USA made Bigsby was now a Japanese version. 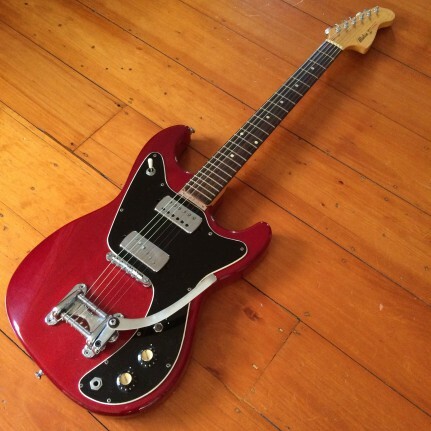 Oh, and the body shape was sort of a Fender Mustang meets Fender Jazzmaster. The Wedgtail style neck remained… but not for long. This is the Series 1 FB70. From what I can tell from the Maton Fyrbyrd build sheets, only 7 examples were made in this format, with this being #007. I only know of two guitars of the 7, so it’s a ridiculously rare guitar. Then in the next batch a few months later Maton updated the model into the Series 2, of which I owned an example for a short while (but sold it to get a vintage MS500) and hope to again soon. The Series 2 had two single coil pickups instead of three humbuckers and a very Fender-like headstock. Maton made 60 or so guitars in this format… but back to the Series 1. The FB70 is a bit of a strange guitar… the body is quite small and thin, with the fretboard sitting quite high on the body. It has a little bit of a banjo quality to it… the previous FB650 feels more solid. The three pickups are quite warm sounding, the hot treble of the classic Maton single coils have gone. They’re more Jazzmaster than Dearmond Goldfoil. It’s still a great guitar and probably one of the coolest looking of the bunch. I’m very grateful to the previous owner Larry to let me be the next custodian of it. I’ll treasure it and play it a lot. The final guitar in the Fyrbyrd family is the FBFX… a guitar I nicknamed the Hulk. This FBFX is a beast. Big thick mahogany body with a fat 70′s Fender style neck. 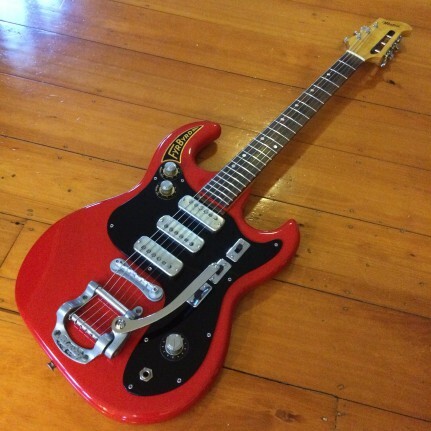 While the original FB620 was a cool garage surf guitar, this is a 70′s rock machine. It’s feels really solid when strapped on, and plays really easily. All the banjo-ness from the FB70 is gone. The trem unit is an Italian Eko and works fine… I personally prefer a proper Bigsby but I’m not modding a guitar as rare as this. The bridge pickup is pretty twangy but has enough power to rock out. The neck is the same mellow unit from the Series 1 FB70. I’ve seen Series 2 FB70′s and FBFX’s with different pickup variations… two single coils, humbucker in the neck – single in the bridge, humbucker in the bridge – single in the neck etc. It’s whatever was at hand on the day i guess. This guitar was found by a fellow Maton collector Greg T who knew how much I wanted one and sold it to me for a great price (same as the FB650). The Maton collector community is a good bunch of people (apart from when I got snaked on that Maton Vampyr deal by another collector. Still hurts. Thanks for that, you know who.) So there you have it. The (pretty much) complete Fyrbyrd family. If I was truly crazy I could go after one of the original 19 fret sharkbites with the 14th fret position marker and the 20 fret shortscale Fyrbyrd (which I had one but sold to get my Sapphire 303/6)… and then there’s the Fyrbyrd Bass… and the New Zealand export Fyrbyrd with the Flamingo tremolo… and the New Zealand export Fyrbyrd Bass (which is basically a Wildcat Bass) but f*ck that. I’m done. It’s taken me 13 years of blood, sweat and trading and I’m way beyond stoked with these Byrds. Now I’m going to play them. I own 2x fyrebyrds 1x sharkbite and 1x lefty 1964. REALLY keen to know if your ever going to do a new run on decals.. would like to get my gats into shape. one in the UK.. one in NZ. Hi, I have a maton fyrbyrd I am looking to sell. Any help would be appreciated . His dad has had it from new. I assume it’s a Stanford case as I have an L series start with a Stamford case and the velvet is same color! Im guessing you know more about these than me. Was their only 120 made? What are the original factory issue tuners on a 1220 Fyrbyrd? Would there have been any that were custom ordered and different to the standard factory issue? Thanks. Hi There, I have a FB650 in red and original velvet lined case. It’s up for sale if you know anyone who would be interested.